It is funny. Every time I'm ready to pen down Zachary's monthly update I go back and read about Alexander. It is fascinating that his monthly update could be almost identical to Zachary's. It is like reading about my little baby now and then! Much less the newborn baby now, Zachary is spending big chunks of the day awake, happy and engaging with his little world and falling into his own little pattern. We introduced a bedtime routine around the same time as we did for Xander and so far Zac is taking to it exceptionally well. He is fairly independent at settling to sleep; happy with a cuddle, dummy or hand in the Moses with him and goes off to sleep quite quickly. Unlike the days of Xander old that required endless rocking, white noise, vibration etc etc. (I'll bet I'll have jinxed that now by writing that!) So far he is going to bed around seven and then sleeping through until around 1.30am or so. Sometimes a bit later. Nights at the moment after that are a bit hit and miss depending on when he has had his last poo... The feed at around 1.30am can be the one and only for the night, or, like last night it can be the first of three wakes ups before 7.00am. Currently Zachary is only pooing once every 3 or 4 days. Although I realise this is perfectly normal for a breastfed baby, when he does finally go it is epic! An excellent night or two of sleep follows a poo day with just the one wake up that night, after that his tummy seems to begin to gripe a bit and he has the smelliest wind (that could compete with his Daddy!) and nights are a little more unsettled until he goes again. At this point with Xander we had started giving him an 11.00pm bottle dreamfeed, at the time it saved our feeding journey and I went on to feed him and loved it until he was 17 months old. My feeding journey with Zachary has been so vastly different, easier from the word go. I love every feed, I love now how he pulls off and often beams one of his beautiful smiles at me, looking right into my eyes so full of love. Experience this time and different baby, but introducing a dream feed hasn't felt necessary, at least not yet. Some how this time is is easier to accept the way things are night by night. But ask me again next month when we're hitting the expected 'four month sleep regression'! 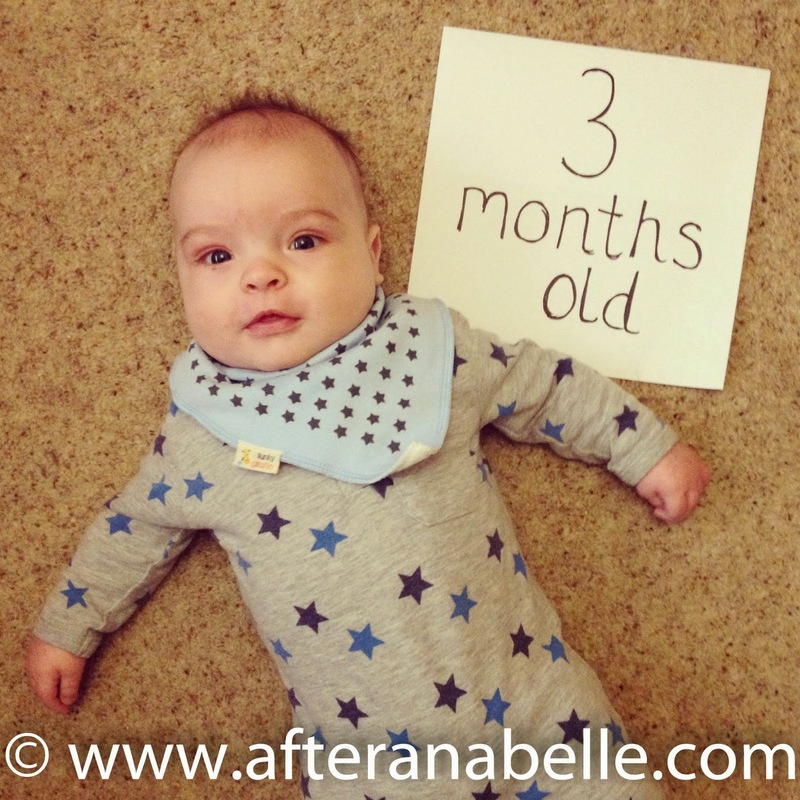 My beautiful boy, at 3 months old you are 13lb 8oz and Mummy has just put all your 3-6 months clothes into the drawers. You are such a happy and clever little boy. You've become a right little chatter box and spend lots of every day cooing and gurgling at Mummy, Daddy or Xander. You have such a lovely soft little voice, but you can be very loud too! You've learnt how to have a 'conversation' and will take turns to chat with us. Xander is definitely your favourite person, you don't take your eyes off him. You love watching him play and get quite excited about his attention now. You are going to love being brothers together. At 11 weeks old you discovered your hands and you seem to like the taste of them. Infact quite often you'll reject your dummy in favour of sucking on your fist of fingers at the moment! Your hand to mouth co-ordination is actually getting pretty good now and you seem to want to nudge the dangly toys off your gym into your mouth. Your favourite toy this month is your baby gym mat. Especially the monkey toy hanging from it. You spend ages staring at his face and chatting along to him. 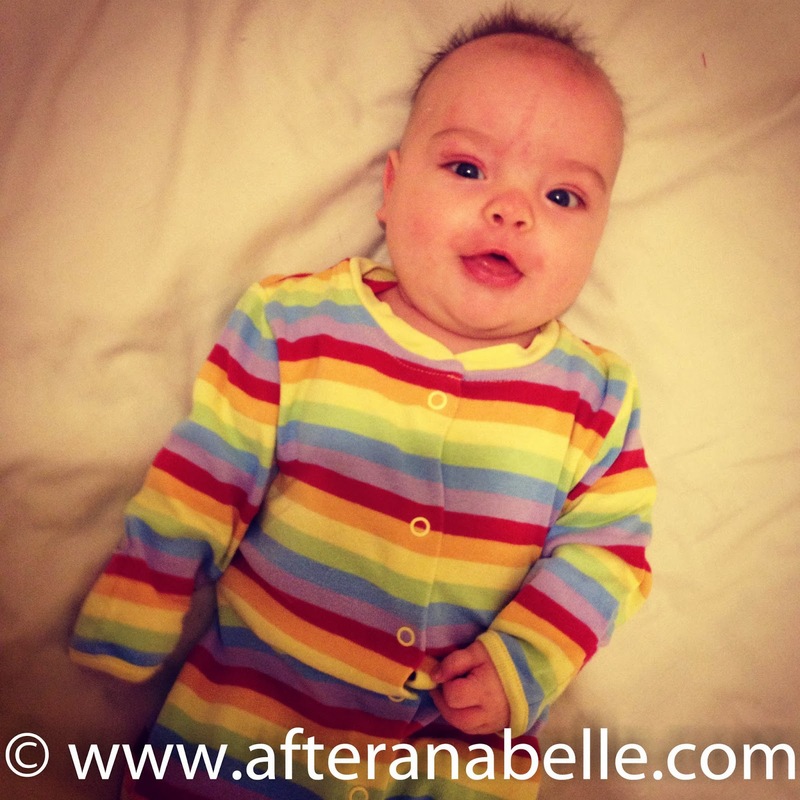 You've rolled onto your side a few times on your playmat, the first time aged 11 weeks old. You are getting stronger all of the time and holding yourself up really well, even seem to be trying to pull up sometimes when you don't want to recline! Although your head still gets tired. You are getting busier and busier every day and Mummy is noticing you falling into your own little routine and pattern now. You are having approximately four naps during the day now and going to bed around 7.00pm and sleeping for lots of the night. We're totally in love with you little man. You and your brother bring such joy to our little family every single day and I love being Mummy to you both so much. If only being a stay at home Mummy could last forever!